Having arrived at Flodigarry hostel I had a chance to sit and take in the view. This was my view to the left. On the right were the dramatic cliffs. The Isle of Skye is small. Just fifty miles north to south and 25 miles east to west. I could feel that smallness. It was cozy. It felt good. Hours from Scotland's cities, houses dot Skye's landscape. The separation from the mainland and the distance between houses had me reveling in the isolation and, at the same time, feeling a sense of community - despite being a traveler. And then, of course, there's the landscape for which Skye is best known. Having arrived at my destination I sat in front of my hostel and looked left where the land of grasses, moss, heather, and bracken faded into the sea. And then I turned my attention to the right where the land rose toward jagged cliffs of granite and a range of rocky cliffs. The Isle of Skye is a feeling as much as a destination. One can go and admire its beauty but I suggest that to really appreciate it one should spend time enveloped in its landscape--a landscape better described by photos than words. Here are a few of my favorites. The southern entrance to the path to The Quiraing. 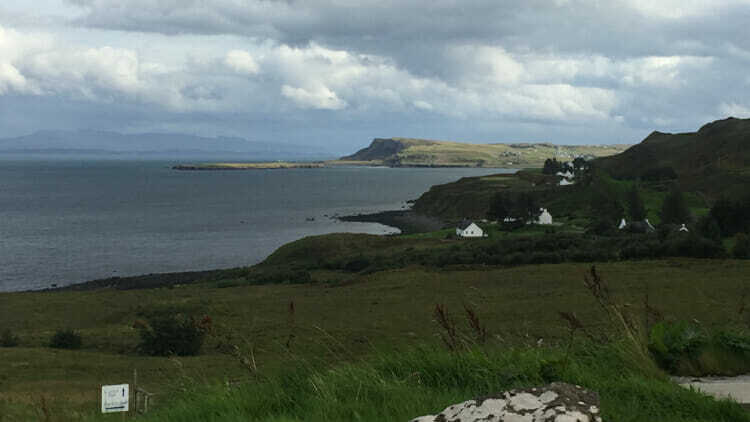 View from the northern coast of Skye near Duntulm. 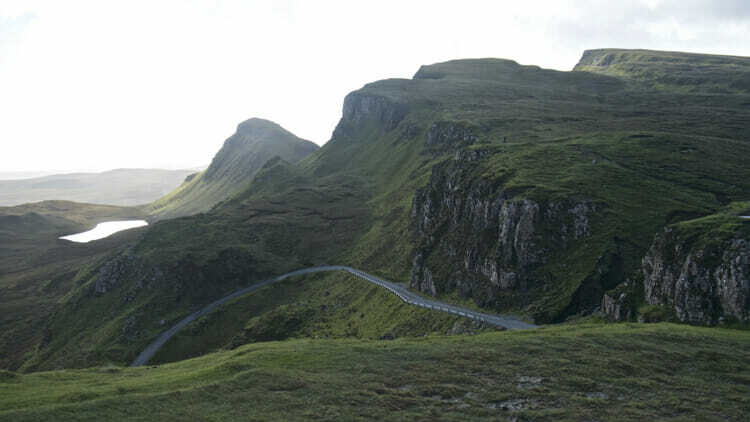 Drive down from The Quiraing. View from Portree on my day of departure. Planning my trip to Skye was a challenge logistically. I could have rented a car but I'm not confident driving on the left side of the road. There are many places to stay, however, they are expensive - most were out of my price range. Plus, I was looking for a bit of quiet. I didn't want to be in a town. Research took me all over the Internet learning what was possible. 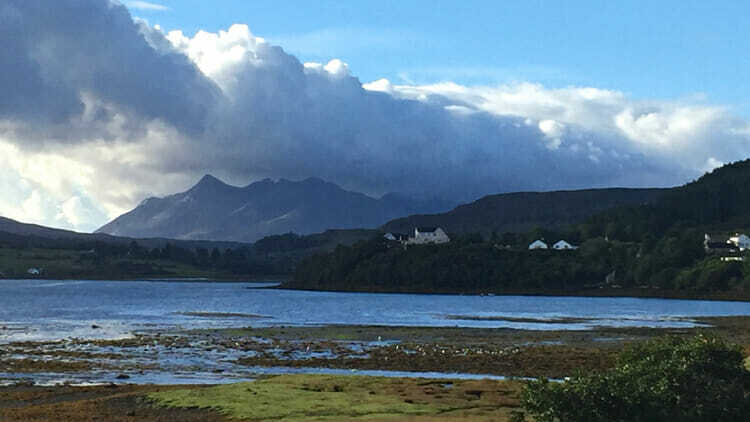 Here's the information I think you need to travel to Skye without a car - what I learned in advance and while there. Portree is the main town on the Isle of Skye. It's the hub for buses. There is a tourist information office in the town to answer your questions and a Coop where you can buy groceries. There are also a number of restaurants there. The Old Man of Storr is the most popular walk. It's busy and unless you're there on the off-season it will not give you that feeling of really being on the Isle of Skye. 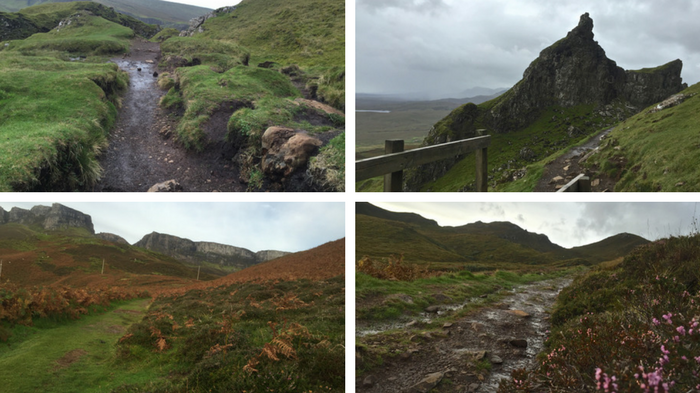 The Quiraing is a hike very worth doing. Most people start at the parking lot on the south end and don't complete the walk. Consequently, that section of the walk is busy. I recommend that you start at the north entry point, which I did. As a result I met only one party of three until I was at the halfway mark. The Fairy Glen and the Fairy Pools are both really worth visiting. The Glen is as beautiful as the Fairy Pools and easy to reach by bus. Walk in from the road. It will be about a 4 km round trip. The main entrance to the Pools is difficult to reach by bus but it is only a 2.4 km round trip to see the pools from the parking lot. 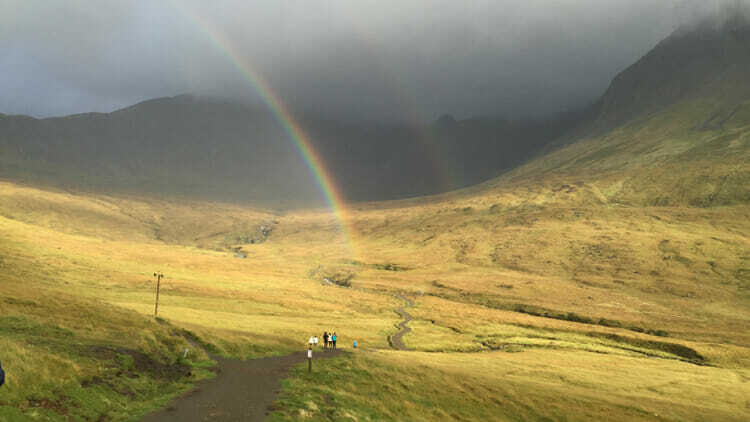 You can take a bus from Portree to Sligachan Hotel and then hike to the pools from there. It's about 8 km each way so you would need a very early start. Finding a Hostel in Skye This was a challenge. Hostelworld represents some but not all hostels in Skye. SYHA is the Scottish version of YHA and again, not all hostels are members. 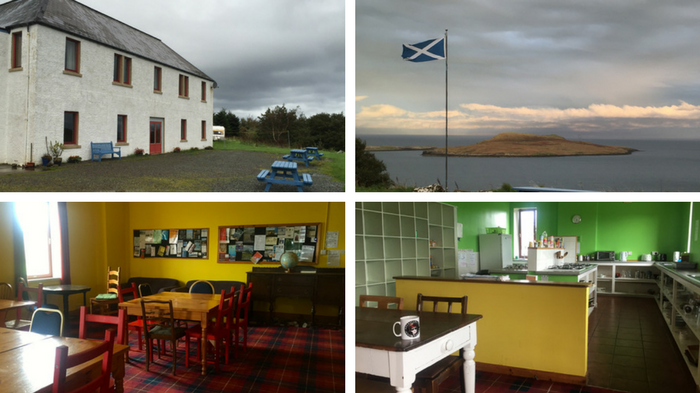 Scottish Independent Hostels is another source for hostels on Skye. I suggest that you check the three sites above to find the hostel that suits your criteria. I stayed at Dun Flodigarry hostel which I found on the Scottish Independent Hostels site. 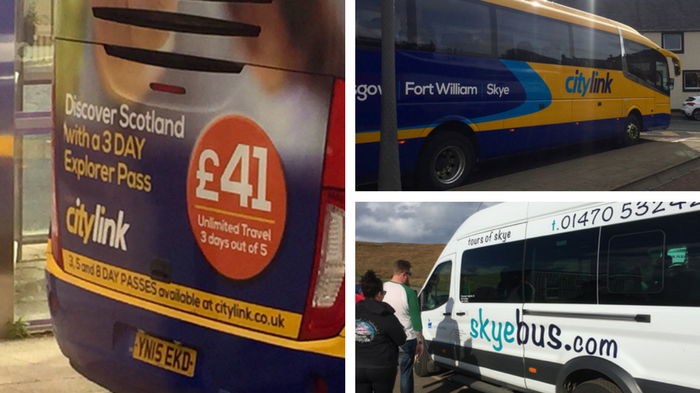 Citylink is the Scottish bus service between towns. You can take the train to the Isle of Skye but that will only get you to the bridge that connects the island to the mainland. To get to Portree you will need to transfer to a bus. I chose to take the bus the whole way. Here's a link to Citylink journey planner and another to their Explorer Pass that will save you money. They have a variety of savings options. I booked my tickets online in advance. This is not necessary but during high season it is highly recommended. Stagecoach is the local bus service on Skye. It is not frequent but their planning tool is helpful. I got caught on a Sunday afternoon in Portree after 5 pm when the service had ended and had to pay for a taxi to my hostel. That was expensive. It's important to note that, outside of the towns, you don't have to be at a designated bus stop for the bus to pick you up. You can flag the bus down. Walking paths are everywhere and are an option. However, if you're trying to get somewhere in particular it's probably not your best choice. Hitchhiking is done on Skye. I had not hitchhiked in decades but because transportation is so limited and the island so small it's done there. I hitchhiked three times and each time I was picked up by tourists. On one occasion it was a couple from Denmark, one of whom is known as Monsieur Guerlain, a perfume blogger. The three of us went for coffee. Real Scottish Journeys is a tour company. 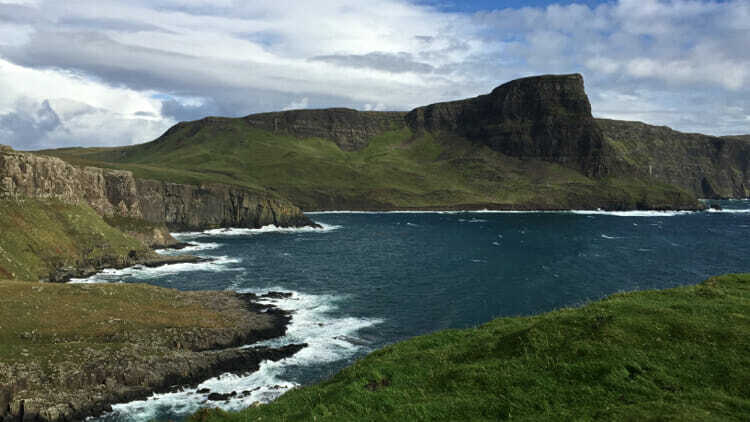 I did a one-day tour with them to ensure that I didn't miss the Isle of Skye's highlights. I'm glad I did because I could not give you an opinion on places like the Fairy Pools otherwise. Bill was an excellent guide, weaving traditional music and folklore into his commentary. If I had a week I would definitely recommend the tour for orientation. However, with little time I would recommend a long walk rather than a bus tour as that's how to experience the real Skye. 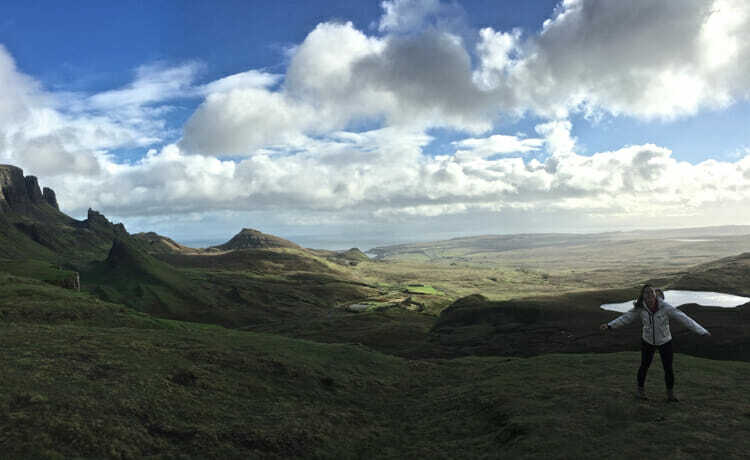 Walking path to The Quiraing from the north entrance.